Contractors should always be seeking ways to drive efficiency in their workplaces. Organisation and pre-planning are key to the successful delivery of a project and companies should try to embed this throughout the project. In partnership with Dome Connect, the contractor created a bespoke online task management system called Gravity Task Manager. This password protected system allows the site to quickly track the fit-out progress in hundreds of apartments per building. 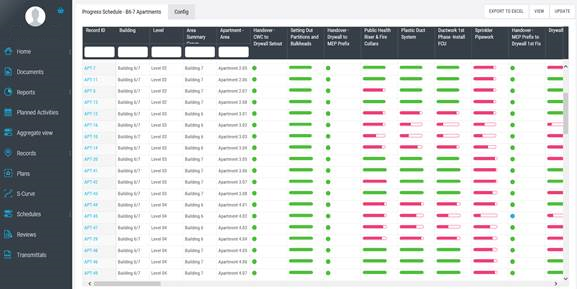 It is live and in use in Buildings 6 & 7, providing real time status, improving control and oversight of works (iPad device driven). The main benefit of this system is to easily track handovers and to manage any possible disputes between trade contractors, saving substantial time to the managers as well as the trades. – The contractor has already provided the contract plan for each package on the system. – Each trade contractor can status their progress for each apartment, indicate their planned handover date and upload their handover documents including any snags. – Then, the next trade contractor can either approve or reject the handover. – In the case of refusal of a handover, the previous trade contractor is able to prove that the reason for the refusal is false and the relevant construction manager will assess and manage the situation. Email notifications are available if wanted. On their dashboards, each trade contractor can easily overview their outstanding actions and know if a new apartment has been available for them. Monitor report. Canary Wharf Contractors. London. December 2017.